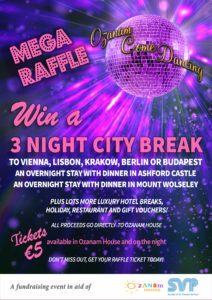 We have launched our MEGA RAFFLE as part of this years Ozanam Come Dancing. 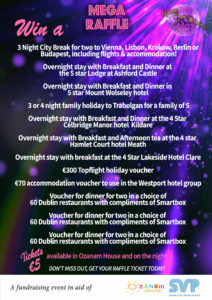 Don’t miss your chance to win lots of Luxury Holiday Prizes and Exclusive Restaurant Vouchers as well as lots more prizes. Tickets are €5 each and are available in Ozanam House or at the show on the night. The Draw will take place at Ozanam Come Dancing 2019, Liberty Hall, on March 8th. DON’T MISS OUT – BE IN TO WIN!